The preferred approach is the field sketch, from nature. Subjects (birds, insects, mammals, plants, landscapes…) are sketched from life, in pencil, then completed mainly in watercolor. The drawing restores an emotion, a mood, behavior, scene, catched a moment through the eyes of the observer. Other techniques, like pastel, also fit the needs of illustration, in the field or in the workshop. 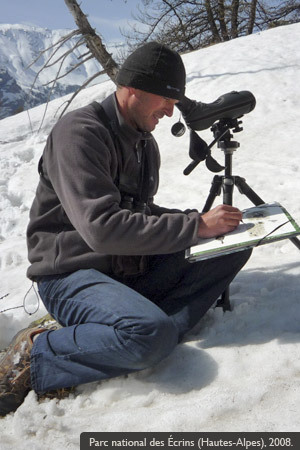 Benoît Perrotin started as facilitator guide in a bird sanctuary, in the late 1980's. It was during this period that he made ​​his first field sketches. In the following decade, he illustrates the issues of the Groupe ornithologique vendéen and publish, including in the journal Intervention Fund for raptors. Then he worked as an illustrator naturalist again in a reserve in a museum in Vendée and exercises in this way since 2002 with the independent artist status.